Payzerware is a cloud-based work management SaaS, offering online and mobile access to service businesses. Office operations are supported by a built-in customer relationship management (CRM) system for centralizing customer contacts and service histories. Inbound calls and service requests can be handled with dispatch capabilities backed by drag and drop, calendar-based technician scheduling. 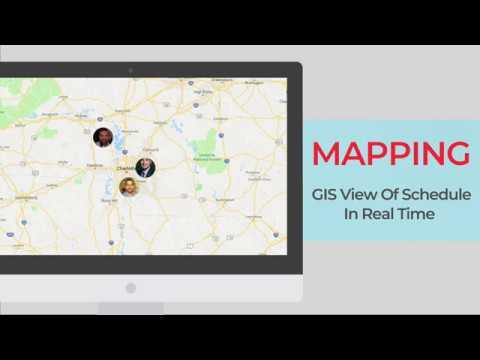 Switch to the GIS view to get geographic feedback plotting job and field staff locations in real time. Automatic reminders alert technicians to scheduled job appointments while notifying customers that a technician is currently on route. Customer proposals and invoicing is joined by functions for selling maintenance plans in the field, with the Payzerware mobile app for iOS and Android facilitating appointment viewing, invoice creation, internal messaging and payments. The latter is aided by Payzerware’s sister solution Payzer, an all-in-one financial and payment processing platform. Again available as a native iOS and Android app, Payzer allows credit cards, debit cards and electronic checks to be accepted in the field. An optional reader peripheral enables card swiping, with additional key features including real time transaction tracking, secure vault for saving cards, automatic email receipts, QuickBooks syncing and a host of administrative controls. • Payzerware is a cloud-based, all-in-one management software solution that enables service contractors and job dispatchers to manage business operations and technicians from the field to the back office. • Payzer is a sister financial tool for securely accepting online and mobile payments, providing features including real time transaction tracking, email receipts, searchable purchase histories and QuickBooks synchronization. • Manage inbound calls and dispatch with a drag and drop, calendar-based appointment scheduling and technician assignment, backed by automated reminders and notifications for customers that a technician is on the way. • A geographic information system (GIS) schedule view plots job locations and tracked technicians on a map, aiding techs and dispatchers with real time update on route directions. • The Payzerware companion smartphone app for Android and iOS allows for remote job and timeclock tracking, viewing appointment schedules and customer records, invoice creation, messaging, plus payment integration. • The Payzer app for Android and iOS allows businesses to make and accept payments within the field, including credit or debit card transactions via an optional card swipe accessory, E-Check payments etc, with the option to send electronic payment notifications to customers. Below are some frequently asked questions for Payzerware. Q. What type of pricing plans does Payzerware offer? Q. Who are the typical users of Payzerware? Q. What languages does Payzerware support? Q. Does Payzerware support mobile devices? Q. Does Payzerware offer an API? No, Payzerware does not have an API available. Q. What other apps does Payzerware integrate with? Q. What level of support does Payzerware offer?